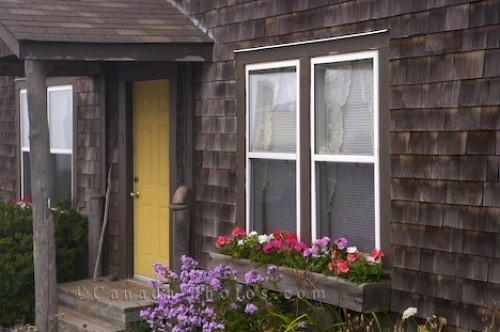 Along the waterfront of the Bay of Fundy in the small town of Margaretsville, Nova Scotia, visitors can enjoy the beauty of a beach house in a tranquil setting. Colorful flowers adorn the exterior of a house located along the waterfront in the picturesque town of Margaretsville in the Bay of Fundy in Nova Scotia, Canada. This restored wooden beach house is one of the few along the waterfront which offers the presence of your own blossoming garden during the spring and summer months. From this waterfront house, the scenery is beautiful as you can watch the highest tides in the world wash away the beach. The sunsets and sunrises are stunning as you sit back and enjoy one of the most relaxing types of vacations everyone deserves. Waterfront property in the town of Margaretsville, Bay of Fundy, Evangeline Trail, Highway 362, Nova Scotia, Canada. Picture of flowers on the outside of a house on the waterfront in the town of Margaretsville in the Bay of Fundy, Nova Scotia.